For most plan sponsors and their asset consultants, the return on asset assumption (ROA) drives investment structure and asset allocation decisions. As U.S. interest rates fell during most of the last 35 years, pension plan exposure to fixed income has fallen to record low allocations. Yet, a plan’s liabilities (the promise) are highly correlated to interest rates. The diminished exposure has created a huge mismatch between assets and liabilities. For years, most industry participants have fully expected growth, inflation, and higher U.S. rates. Well, we’ve seen short-term rates rise during the last 15+ months, but longer rates, such as the U.S. 10-year Treasury, have been in a period of relative calm. In fact, yields on the 10-year have actually fallen by about 3-4 basis points in 2017, much to the dismay of many market forecasters. For regular readers of the KCS blog and Fireside Chat series, you may recall that in March 2017 we reissued a Fireside Chat that we had produced back in 2013 on why we didn’t see U.S. long rates rising much in the near future. Our interest in reproducing this piece was our feeling that 2017 would not be the year that longer rates would spike, and they haven’t. As equity markets continue to move forward with little concern for valuation, plan sponsors should begin to reallocate their asset class exposures back to long-term policy normal levels. In doing so, they should consider adopting a cashflow-matching strategy for their fixed income exposure to mirror monthly benefit payments for the plan’s retired lives. We’d certainly welcome the opportunity to discuss the appropriateness of this strategy. What Would You Pay For This Company? Will You Retire One Day? The Washington Post has produced a terrific story on the 998 workers impacted by the 1994 closure of the Tulsa, Oklahoma, McDonnell Douglas plant. Many of the employees interviewed were able to eventually find work again, but in many cases, their new wages were less than half of what they had been making at MD. Unfortunately, it wasn’t just the loss of wages that has negatively impacted these workers, but the loss of pension benefits that they never were able to replace through their new employers. Many of these individuals, now in their 70s, are still working today because of their lack of retirement assets and financial security. I’ve heard people joking over the years about likely having to work as a greeter at Wallmart because of their lack of retirement savings, but for several of the former employees in this cohort, that is exactly their reality. Their financial struggles include losing their homes, incurring significant debt burdens, liens, etc. Roughly 15% of them have had to file for bankruptcy. Small companies have always found it challenging to be able to provide a retirement benefit to their employees, but for midsize and large companies, nearly 60% offered a pension plan at one point. Regrettably, the percentage covered by a traditional pension plan has fallen to only 14% of the private sector, when considering all employers, and that percentage is likely to continue to fall rapidly, as today’s employees are living longer exacerbating the liability that these companies are trying desperately to eliminate. Amazingly, most of these employees were in the MD pension plan long enough to secure some retirement benefit, if even a small one. Can you imagine the financial distress that many of our workers will soon face knowing that they only have Social Security to rely on? The Washington Post story claimed that the average SS payout is a little more than $14,000 (we think that it is >$16,000), which certainly isn’t nearly enough for anyone to live on for any length of time. We have written a ton on the impending retirement crisis. It isn’t a joke. The U.S. will have tens of millions of once productive members of our society falling onto the social safety net. Let’s not let that happen. We need a recommitment to provide our employees with a benefit upon retirement that will supplement Social Security. Asking untrained employees to fund, manage, and then disperse a retirement benefit is a challenge that most of our workers are not going to handle appropriately. 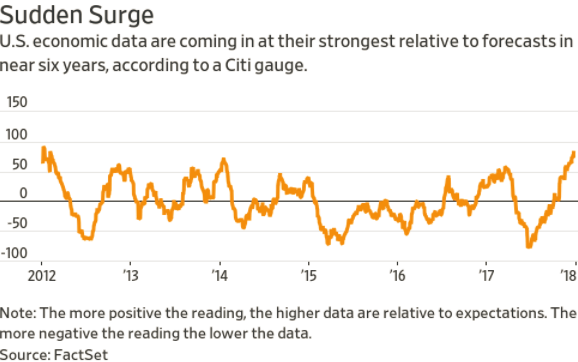 Saw an interesting note this morning regarding Citigroup’s U.S. economic surprise index. Obviously, 2017 has been an incredible year for the markets with the S&P 500 up more than 20% so far, reflecting a strong economy that has achieved its highest sustained growth in more than 3 years. However, when this reading has achieved such lofty heights previously (>70, it is now 84.5), the subsequent 6 month period has been modest at best for the U.S. equity markets. In fact, according to Jim Paulsen, CIO, Leuthold Group, the S&P 500 has only achieved a 2.8% annualized return during the next 6 months. The momentum witnessed in the economy is likely to lead research analysts to continue to ratchet up their economic forecasts making it very difficult for the economy to continue to surprise going forward. Markets tend to outperform when expectations are more modest providing opportunities for positive surprises. Happy Holidays, Merry Christmas, and a very happy, healthy, and prosperous New Year to you and yours from the Kamp Family. Thank you for your support and friendship in 2017. I very much look forward to what 2018 might bring. Consumer debt has hit an all-time high of 26% of disposable income. In the past five years, consumer debt has outpaced income growth by roughly twice. As a reminder, consumer debt excludes mortgages and home equity loans. The growth in consumer debt has been driven by auto and student loans, no surprise there. However, what does this portend for the consumer and our economy? According to Ray Boshara, Senior Adviser and Director, Center for Household Financial Stability could be both positive and negative (now doesn’t that sound just like an economist). According to Ray, the significant growth in consumer debt could reflect American’s greater confidence in the economy, willingness to invest in assets that build wealth, such as education, and it can also signal that consumers have taken advantage of the lower interest rate environment by paying off previous loans and are now seeking additional borrowing. However, this growing debt could signal trouble ahead for the U.S. economy, as families use debt to acquire necessities. Rising family debts can diminish future economic activity. In a period of rising rates, the extra interest burden could put this debt at risk of repayment. We are already witnessing troubling trends with regard to the repayment of the massive U.S. student loan debt (roughly $1.5 trillion). In any case, the growth of consumer debt relative to income growth certainly reduces the amount of disposable income available to fund retirement accounts, in an age where individuals are already contributing far less than what is necessary to build an adequate retirement nest egg. According to the WSJ, there are two provisions in the tax bill that relate to retirement. First, borrowers of 401(k) loans will now have more time to pay back the loan after leaving their job. Currently, the employee has to repay the loan within 60 days following departure from their employer or face taxes and a possible 10% penalty, if younger than 59 1/2 years old. In the new bill, the loan must be repaid or the proceeds rolled into an IRA by the date of their next Federal tax filing. The other provision relates to the recharacterizations of Roth conversions, which will cease to exist in the new tax bill. Currently, a conversion to a Roth from a traditional IRA can be reversed by October 15th of the year following the conversion. This tactic was often used by Roth account owners when account balances fell, eliminating the gains that they would have been taxed on. Thank goodness that early attempts to significantly reduce tax-free contributions into 401(k) plans were rejected. Clearly, we do not need any additional obstacles for individuals to fund their future retirements.